The Lexmark X463de MFP offers duplex printing, copying and scanning, with output speeds up to 38 ppm, plus an intuitive colour touch screen for user-friendly operation. Scan directly to a flash drive or use a flash drive to store and retrieve your personal MFP settings with the MyMFP feature. Illuminated guides show you where to place your originals, so you can scan perfectly every time. "Experience more productivity than you could ever imagine! Lexmark’s new multifunction devices come solutions-ready. That means they can be customised easily to meet your unique printing needs. Contact your Lexmark representative to find out how simple it is to tailor your MFP with one or more of Lexmark’s leading industry solutions. With the touch of an icon you can transform your hardcopy documents into digital workflow, helping you print less, save time, lower costs, and reduce the environmental impact of printing. Embedded Solutions Framework is optional on Lexmark X463de and Lexmark X464de (requires hard disk and 256MB memory)"
When you email a large file from your Lexmark X460 Series MFP, it won’t cause a traffic jam on your network. That’s because traffic-shaping technology can partition your network traffic and designate lower bandwidth for outbound flows. This is useful for busy networks and externally hosted Web servers, and especially Wide Area Networks (WAN). Get remarkable scan quality with up to 600 x 600 dpi resolution. Small in size but big on talent, these devices offer the ultimate combination of built-in features and flexibility to let you breeze through office work more quickly, efficiently and intelligently than ever before. Consolidating all your document functions into one efficient network device can save money on hardware, energy and supplies. But Lexmark takes eco-accountability further to help you print responsibly at every phase of your office work. Just walk up, insert a flash drive, select a PDF, XPS or image file and start printing. Like all of Lexmark’s business-class devices, the Lexmark X460 Series MFPs come standard with Lexmark’s solid guarantee of 1-Year Onsite Service, which provides you with next-business-day response. You can also extend your guarantee further with a customised offering to match your specific needs. This can cover everything from guarantee extensions (up to a total of five years) to installation, training and much more. From network security to user- and function-access restrictions, Lexmark offers you a wide range of features to help protect your valuable data and ensure network security. In addition to IPSec, SNMPv3 and 802.11x network security, the Lexmark X460 Series offers an alphanumeric pad for easy PIN authentication, plus encryption and disk wiping to secure your optional hard disk. Boost your total input capacity by adding a second drawer (up to 250 or 550 sheets). Print on diverse media types, like envelopes, labels and card stock without removing your paper from the main tray. One person’s setback should not mean a bottleneck for the whole workgroup! Say someone launches a print job that requires labels, but none is loaded. Why lose precious uptime? Lexmark’s Job Waiting feature will simply hold that job aside while everyone else goes on working without interruption (hard disk required). Right out of the box, your Lexmark X460 Series MFP will power through your workload at exceptionally fast speeds – whether you’re scanning documents, copying spreadsheets or printing out important presentations. 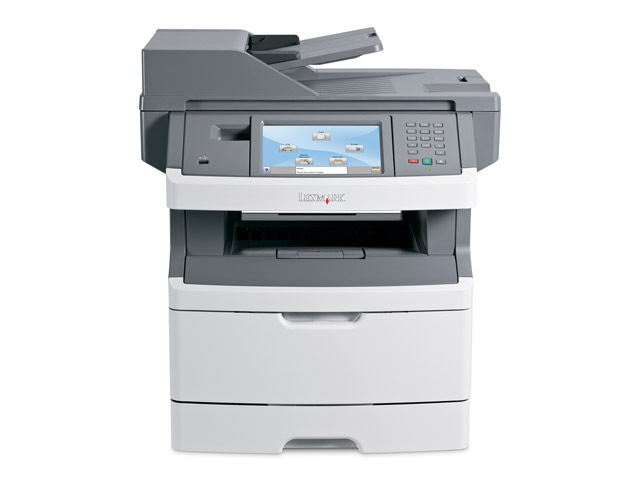 Lexmark MFPs are a breeze to set up, install and operate. And they keep you and your office close to the business tools they need to get the job done. No more lost time running between multiple devices. Productivity is now just a touch away! Load your stack of originals – up to 50 sheets – and let the automatic document feeder do the work for you. These devices are network-ready and very easy to set up. If you have multiple Lexmark devices installed, the Lexmark Universal Driver offers even easier deployment. Once up and running, on-screen custom messaging makes life simpler too by providing users with clear information, like intuitive show-me messaging. What’s more, Lexmark MarkVision Professional software provides simplified remote management and automated tools to keep your workday flowing! A real efficiency booster, Lexmark’s MyMFP feature lets multiple users save and re-access their personal settings on a simple flash drive, including their local address book, individual copy settings, and even their own touch-screen configuration. They simply walk up to the MFP, slide in their flash drive and the MFP literally transforms into their own personal device. 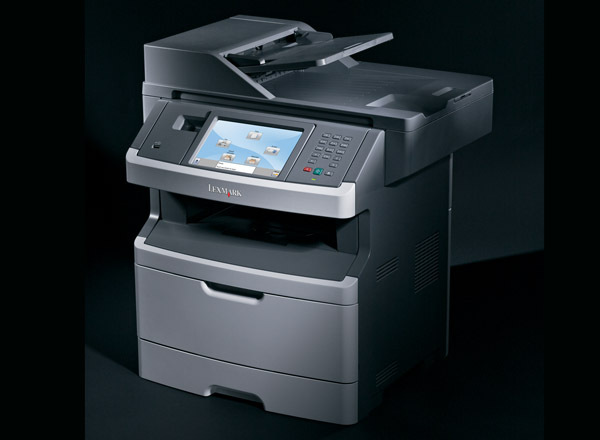 Compact and reliable, the Lexmark X460 Series MFPs bring serious performance benefits to small and medium-sized workgroups. Benefit from powerful productivity tools, cost-saving workflow solutions, and a large, intuitive colour touch-screen interface for amazingly simple access to a rich range of features. This includes duplex scanning, advanced copying and easy user authorization for enhanced security.